Pootharekulu: Pootharekulu or Poothareku (singular) is a popular sweet from Andhra Pradesh, India. PoothaRekulu are also known as ‘Paper sweets’ as they give the appearance of folded paper. It is a labor-intensive job, but it is a dying art. It is made from a particular rice batter called jaya biyyam (biyyam means rice), powdered sugar and ghee (clarified butter). There are two versions of this sweet. One uses powdered sugar and the other one using jaggery. Melt the ghee and keep aside. Dampen the kitchen towel with some water. Place the wet kitchen towel over the rice paper sheets, to make the rice paper sheet moist and malleable. Note: Alternatively, you could also sprinkle some water on the sheets to soften them. Spread, in an even layer, one tablespoon of ground sugar on the top of the moist rice paper sheet. Pour a teaspoon of ghee all over the rice sheet. Layer another moist rice paper sheet on the first sheet. Spread around another tablespoon of some powdered sugar on the top of the second sheet. 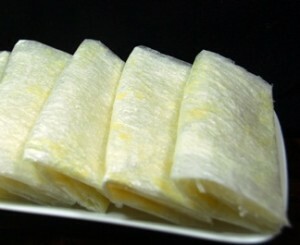 Stack 4 rice paper sheets in similar manner to make 1 Poothareku. Fold on the top, from one longest side, till the centre of the stack. Fold the other longest side in order to overlap the first side which is folded. Spread around another tbsp of the ground sugar on top of the folded strip. Pour a tsp of ghee all over the rice strip. Fold the ends of the sheet all together once and then fold the remaining part into a rectangular strip. Now repeat this procedure with the remaining rice paper sheets. Pootharekulu are ready to be served. Serve pootharekulu with a quenelle of double cream.